Windstar Cruises was created as a three-ship fleet of identical sailing vessels in 1986. Wind Star, Wind Spirit and Wind Song were the originals; in 2002, Wind Song suffered a fire in French Polynesia and sank. 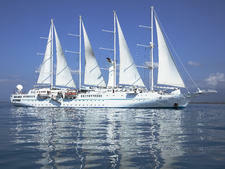 Wind Surf, built in 1990, joined Windstar in 1998. 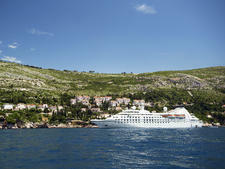 The cruise line underwent a major renaissance following its 2011 acquisition by Denver-based Xanterra Parks and Resorts. That company is best known for operating national and state park concessionaries, and it also owns disparate tourism-oriented companies, such as VBT Worldwide (bicycling and other tours) and Williamsburg. Xanterra has invested millions of dollars not only in refurbishing the existing Wind Star, Wind Spirit and Wind Surf but also in acquiring the three former Seabourn ships (Star Pride, Star Breeze and Star Legend). The acquisitions signify Windstar is broadening its reach while remaining committed to the easygoing, casually elegant cruising style that its sailing vessels have made popular. 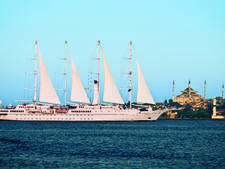 The doubling of the fleet also offers Windstar a chance to expand its itineraries to places like Asia, the Middle East, Alaska and Canada and New England. 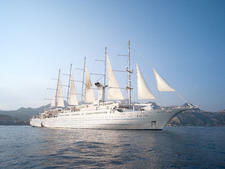 Once known solely for its masted ships, Windstar doubled its fleet with the addition of three ex-Seabourn motor yachts. All ships feature itineraries that mix marquee and exotic ports, a variety of dining venues with top-notch cuisine, superb service and the intimacy of small ship cruising. Whether it's 148-passenger Wind Star and Wind Spirit, 310-passenger Wind Surf, or just-added 212-passenger power yachts Star Pride, Star Breeze and Star Legend, all ships feature a luxury-minded 1.5-to-1 passenger-to-crew ratio. On the sailing ships, cabins include Bose SoundDocks, flatscreen televisions, L'Occitane amenities, indulgent bedding, and fresh fruit and flowers. Each of these vessels also has a sports marina where, in select ports in which the ships are anchored, passengers can engage in water sports like kayaking, snorkeling, swimming, windsailing, paddle-boating and water skiing. Before joining Windstar, the ex-Seabourn trio underwent refurbishment programs. In particular, Star Breeze and Star Legend received investments of $8.5 million; cabins were refurbished, the line's trademark venues -- from its AmphorA main restaurant to its Compass Rose lounge -- were upgraded, and the pool and sun deck were completely redesigned. Star Pride got the full revamp in 2016. One of the biggest changes for the line across the fleet is its dining upgrade. Cuisine aims to highlight the local fare of the regions visited, including the Mediterranean, Costa Rica, Asia, Tahiti and the Caribbean. The food is high quality, and extra attention is paid to those with special dietary needs. AmphorA, the ships' main restaurant, serves Continental-focused cuisine in an open-seating setting. Candles Grill offers a steakhouse-style menu, and Stella Bistro, available only on Wind Surf, is a reservation-only French inspired venue. For breakfast and lunch, the intimate Veranda, Windstar Cruises' buffet venue with indoor and outdoor seating, combines made-to-order grilled items with food stations. The most significant difference between the trio of sailing ships and the newly acquired series of yachts is stateroom size. On Windstar's Wind Star, Wind Spirit and Wind Surf, standard cabins measure a cozy 188 square feet and have ocean views but no balconies. Views are from porthole-style windows. Bathrooms are compact and shower-only. Wind Surf does offer 360-square-foot suites (essentially two standard cabins put together); one side is a dedicated living room, while the other is a bedroom. In all cases, Windstar's small ships create a cozy, intimate cruise experience, but its a la carte pricing strategy -- you'll pay extra for gratuities, cocktails, shore excursions, Wi-Fi, airfare and spa treatments -- means cruise fares fall in the somewhat moderate category, compared with the more-inclusive luxury lines. "Casual elegance" is the designated dress code, and that idea permeates the onboard vibe. Passengers leave ties and formalwear at home in favor of country club casual sportswear, day and night. There are few organized activities and none of the typical cruise line Vegas-style revues. Windstar passengers tend to be active, well-traveled, well-educated adults of all ages, hailing from North America, the U.K., Australia and New Zealand. They enjoy the more laid-back atmosphere of a smaller ship, the idea of traveling under sail and the unique itineraries that Windstar provides. Wind Surf, at 14,745 tons and with a passenger capacity of 310, is the largest of the line's sailing vessels and has five masts. (The other sailing ships each have four.) Built in 1990 as Club Med I, it joined the fleet in 1998. 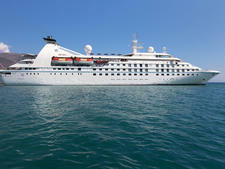 Siblings Wind Star and Wind Spirit each measure 5,530 tons and carry 148 passengers. They launched in 1986 and 1988, respectively. All three ships received enhancements via an $18 million refurbishment program in early 2013, which included cabins (notably in the bathrooms), public rooms and deck areas. Star Pride joined the Windstar fleet in May 2014 as the line's first all-suite power yacht, carrying 212 passengers. Its nearly identical siblings, Star Breeze and Star Legend, debuted in May 2015.